In the span of 2 weeks, over 60 active Instagram accounts collectively generated more than 1,000 posts consisting of photos, videos, and animated GIFs that champion #NAPAUNITY in action! NAPA thanks the following fraternity/sorority headquarters and local chapters for completing the “12 Days of NAPA Unity Photo Challenge” on social media: @aphig_uic • @betachi_iu • @betachitheta99 • @cornellakdphi • @dallasdkd • @deltaepsilonpsi • @deltakappadelta • @deltaphilambda • @deltaphiomega98 • @deltasigmaiota • @depsi_ai • @depsi_ak • @depsi_al • @depsi_alphadelta • @depsi_beta • @depsi_bing • @depsi_iota • @depsi_lambda • @depsi_upsilon • @depsitau • @dkd_beta • @dkd_nyu • @dkd_umass • @dkd_unt • @dkdbaylor • @dkdtamu • @dkduic • @dpo_bing • @dpo_denton • @dpo_gamma • @dpo_lambda • @dpo_newark • @dpo_tau • @dpo_texastech • @dpo_ucf • @dpo_uconn • @dpo_umtc • @dpo.sigma • @dpoalpha • @dsialpha • @dsidelta • @gmuakdphi • @ind1994 • @kappaphigamma • @kpib_mizzou • @kpib_uic • @kusigmapsizeta • @lincolnlphie • @loyolalambdas • @ncsulphie • @niu_chisigs • @pdpsi_ucf • @pialphaphi1929 • @sigmasatuva • @syracuselambdas • @thejadetimes • @uconndphil • @unlsyz • @usf.pdpsi • @usf_akdphi • @usfkappas • @uvakdphi • @uwlambdas • @vtechakdphi • @wiakdphi_caa • @wichitasigmas • @wisconsinakdphi View this post on Instagram In the spirit of the holidays, NAPA invites everyone to participate in its annual "12 Days of #NAPAUNITY Photo Challenge!" Starting today, tag #NAPAUNITY in photos with other fraternity and sorority members. 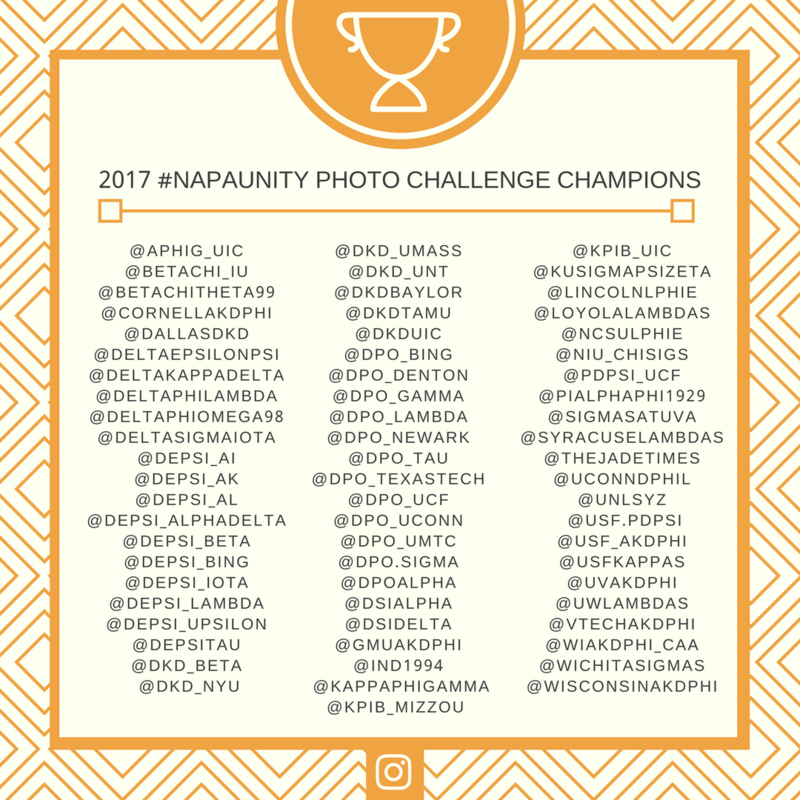 Those who complete the entire photo challenge by December 30, 2017 will receive a social media shoutout from @NAPAHQ! Submissions from chapter and organization accounts are encouraged! 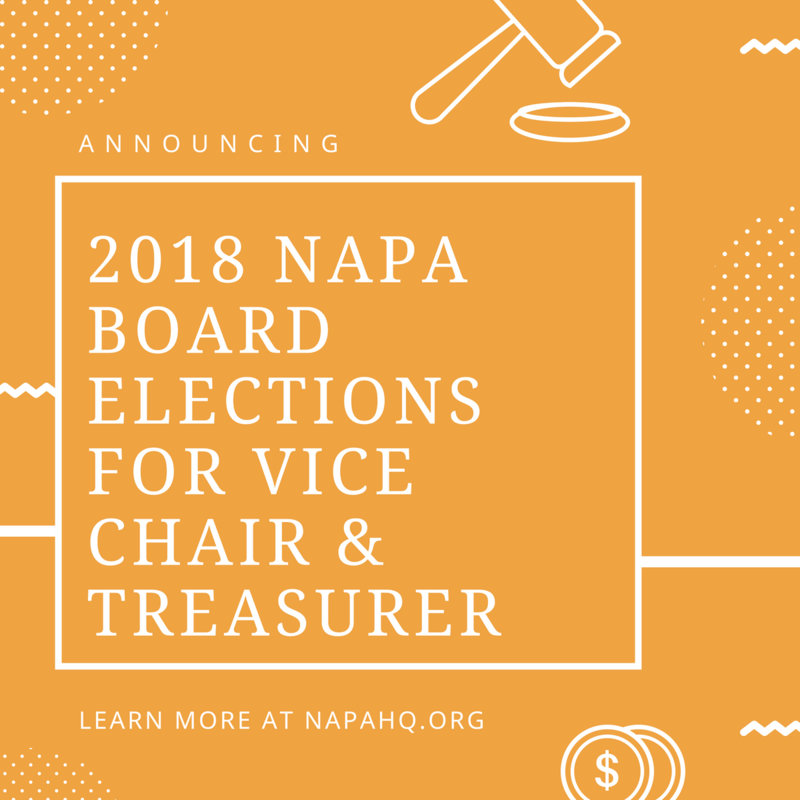 Membership in a NAPA organization is not required to participate. Please repost and retweet to share the word! Swipe left to see last year's photo challenge champions! 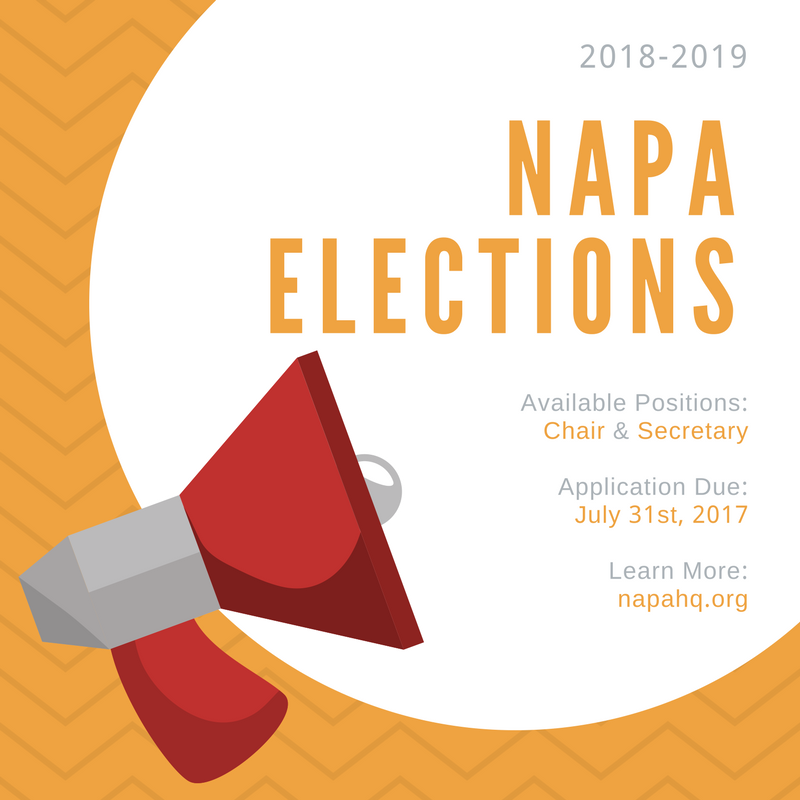 🏆 A post shared by NAPAHQ | Asian Greek Life (@napahq) on Dec 12, 2017 at 12:16pm PST NAPA recommends following their Instagram feeds to see more NAPA unity in 2018! FOR IMMEDIATE RELEASE July 13, 2017 Fraternal ‘Umbrella’ Organizations Unanimously Support New Anti-Hazing Legislation Rep. Patrick Meehan, R-Pa., and Rep. Marcia Fudge, D-Ohio Introduce the Report and Educate About Campus Hazing (REACH) Act WASHINGTON — Officials from the National Panhellenic Conference (NPC), North-American Interfraternity Conference (NIC), National Pan-Hellenic Council, Inc. (NPHC), National Association of Latino Fraternal Organizations (NALFO), National Asian Pacific Islander Desi American Panhellenic Association (NAPA), National Multicultural Greek Council (NMGC), and Association of Fraternity/Sorority Advisors (AFA), issued the following statements today endorsing anti-hazing legislation introduced by Rep. Patrick Meehan, R-Pa., and Rep. Marcia Fudge, D-Ohio. The Report and Educate About Campus Hazing (REACH) Act would require colleges and universities to disclose information about hazing on campus in their annual crime reports. It would also require any college or university that accepts federal funding to provide hazing prevention education to all students. This united support for the REACH Act comes from all the fraternal “umbrella” organizations, which collectively represent more than 140 fraternities and sororities, as well as the association that provides development to professionals who work with fraternities and sororities. Statement from the National Panhellenic Conference “Students have long had access to accurate and timely information about security issues on campus, and they deserve the same transparency about incidents of hazing,” said Dani Weatherford, NPC Executive Director, on behalf of the organization’s Board of Directors. “No single piece of legislation can eradicate hazing on campus, but it can ensure that students, administrators and parents have access to the tools and information they need to hold organizations and campuses accountable. The battle against hazing is not a problem for fraternities alone, but a call-to-action for all campus-based organizations – including the sorority community. We stand with elected leaders, campus officials and students nationwide as committed partners in this fight.” Statement from the North-American Interfraternity Conference “Research shows hazing prevention is best accomplished through comprehensive measures, including proactive education, transparency and accountability around standards,” said NIC President and CEO Judson Horras. “The North-American Interfraternity Conference backs the REACH Act because it focuses on these critical strategies. NIC member fraternities stand united in providing positive, hazing-free, meaningful rites of passage that strengthen and develop young men.” Statement from the National Pan-Hellenic Council “The Council of Presidents of the National Pan-Hellenic Council commends the bipartisan leadership of Rep. Pat Meehan and Rep. Marcia Fudge and supports the objectives of the REACH Act,” said Dr. Paulette C. Walker, Chair of the NPHC Council of Presidents and National President of Delta Sigma Theta Sorority, Inc. “The organizations of the NPHC are resolute in the commitment to nurture the ideals of sisterhood and fraternalism and uphold the dignity and self-respect of all persons seeking membership in the respective organizations,” said Jennifer Jones, NPHC President. “Hazing is antithetical to this commitment. NPHC organizations collaborate with universities regarding hazing concerns and believe that university-sponsored hazing education and annual reporting of hazing incidents will be important tools in a more comprehensive and proactive approach to combat hazing.” Statement from the National Association of Latino Fraternal Organizations “Many of our members—first- and second-gen students—are sent to college by parents unfamiliar with the traditions that occur at some universities. 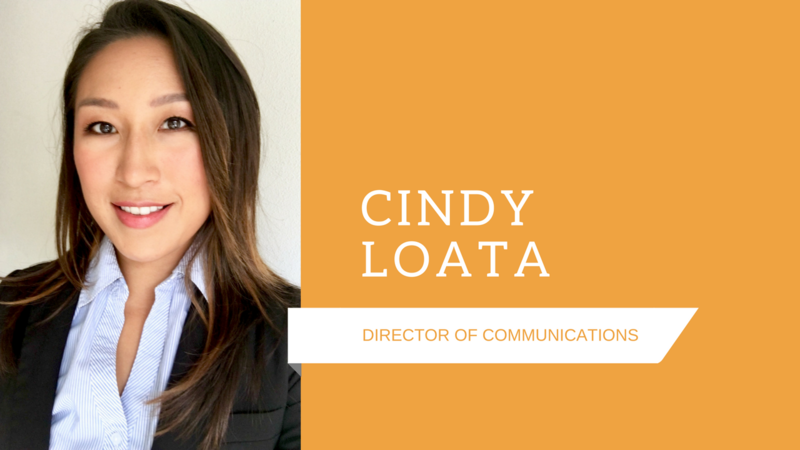 Our students look for places of belonging and trust that universities are doing their best to prevent harm to their students,” said NALFO President Maria Diaz. 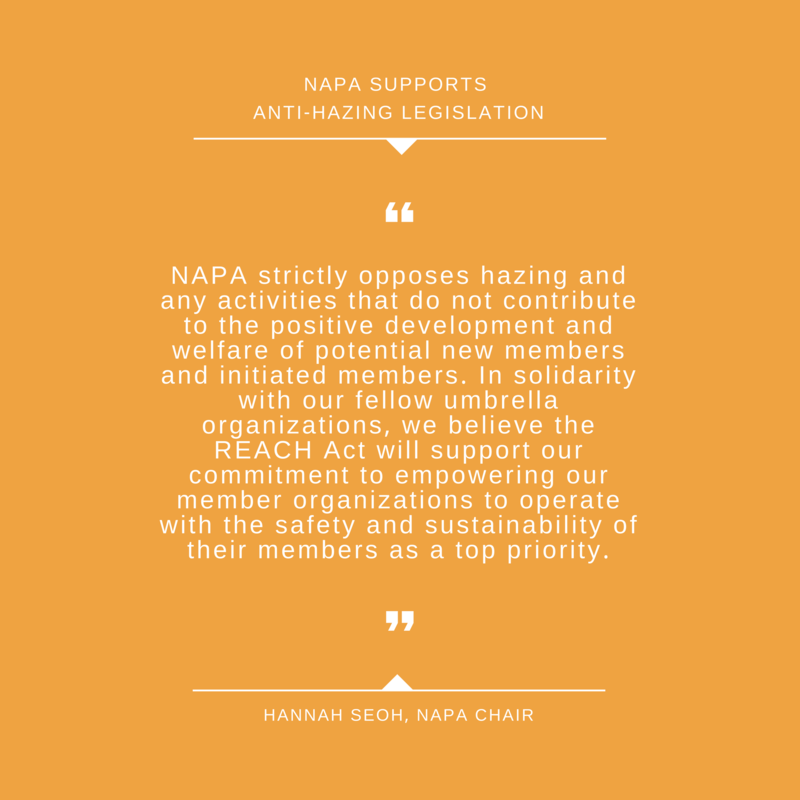 “Through our shared standards and membership requirement for each organization to have clear anti-hazing policies, NALFO strives to assure that each student is able to participate in our organizations’ traditions in a safe and supportive way. 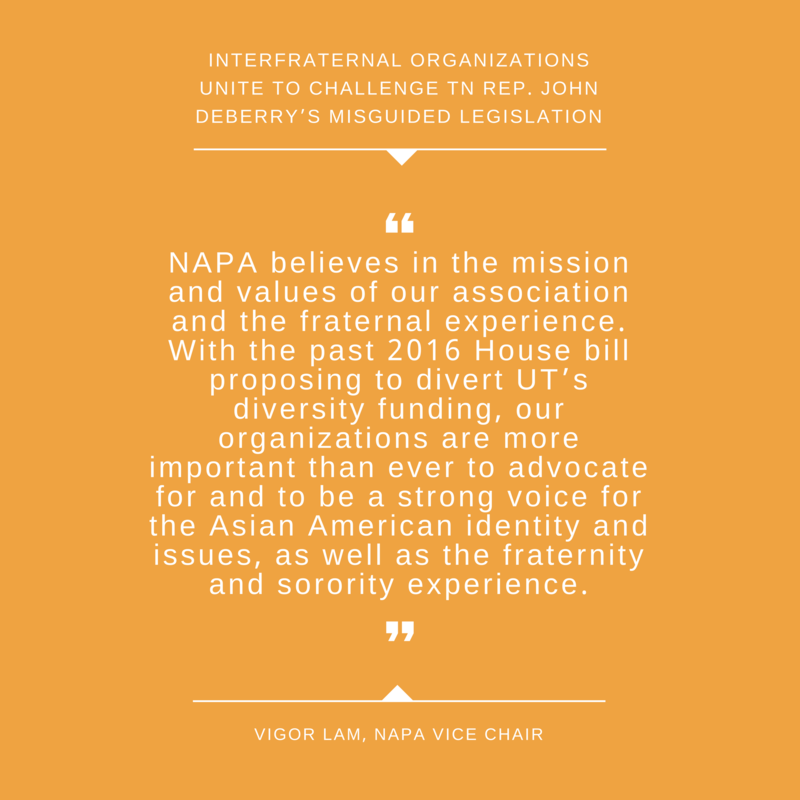 The REACH Act will arm our students and parents with access to information that will help them make an informed decision on what institution to entrust with their well-being.” Statement from the National Asian Pacific Islander Desi American Panhellenic Association “NAPA strictly opposes hazing and any activities that do not contribute to the positive development and welfare of potential new members and initiated members,” said NAPA’s Executive Board. “In solidarity with our fellow umbrella organizations, we believe the REACH Act will support our commitment to empowering our member organizations to operate with the safety and sustainability of their members as a top priority.” Statement from the National Multicultural Greek Council “The National Multicultural Greek Council organizations each dedicate substantial time and resources to improving the lives of individuals and bettering their communities,” said NMGC President Jen Rencher. “Accordingly, a membership intake process that utilizes and/or condones acts of hazing is contrary to the mission and purpose of the NMGC and its Member Organizations. As such, we support the REACH Act for providing transparency about hazing incidents and education on how to combat it for the campus community.” Statement from the Association of Fraternity/Sorority Advisors “Hazing on college campuses is a complex problem and addressing it requires a multi-faceted approach,” said Lynda Wiley, Executive Director of AFA. “A combination of information, education and accountability is necessary to eliminate this behavior. Including hazing information in Clery reporting will help students and parents as they ask important questions related to joining a variety of organizations, including fraternities and sororities. AFA is committed to continual professional education for our members and would provide training around implementation of the REACH Act if it becomes law.” # # # About the National Panhellenic Conference NPC is the umbrella organization specifically charged with advocating on behalf of the sorority experience. It is comprised of 26 national and international sororities that are autonomous social organizations. Collectively, NPC sororities are located on more than 670 campuses with approximately 380,000 undergraduate members and more than 4.5 million alumnae. About the North-American Interfraternity Conference Founded in 1909, the NIC is the trade association that represents a diverse range of inter/national men’s fraternities, including historically black, multicultural and emerging organizations. NIC’s 66 member organizations boast more than 6,100 chapters located on more than 800 campuses in the United States and Canada, with approximately 380,000 undergraduate members and nearly 4.2 million alumni. About the National Pan-Hellenic Council NPHC is comprised of local councils drawn from the ranks of 1.5 million college and professional members of the nine historically African-American fraternities and sororities, namely: Alpha Phi Alpha Fraternity, Inc.; Alpha Kappa Alpha Sorority, Inc.; Kappa Alpha Psi Fraternity, Inc.; Omega Psi Phi Fraternity, Inc.; Delta Sigma Theta Sorority, Inc.; Phi Beta Sigma Fraternity, Inc.; Zeta Phi Beta Sorority, Inc.; Sigma Gamma Rho Sorority, Inc.; and Iota Phi Theta Fraternity, Inc.; and the Council of Presidents of these member organizations who come together on issues that promote the common purposes and general good for which these organizations exist. About the National Association of Latino Fraternal Organizations NALFO is the coalition of 16 Latina/o based sororities and fraternities in the United States. 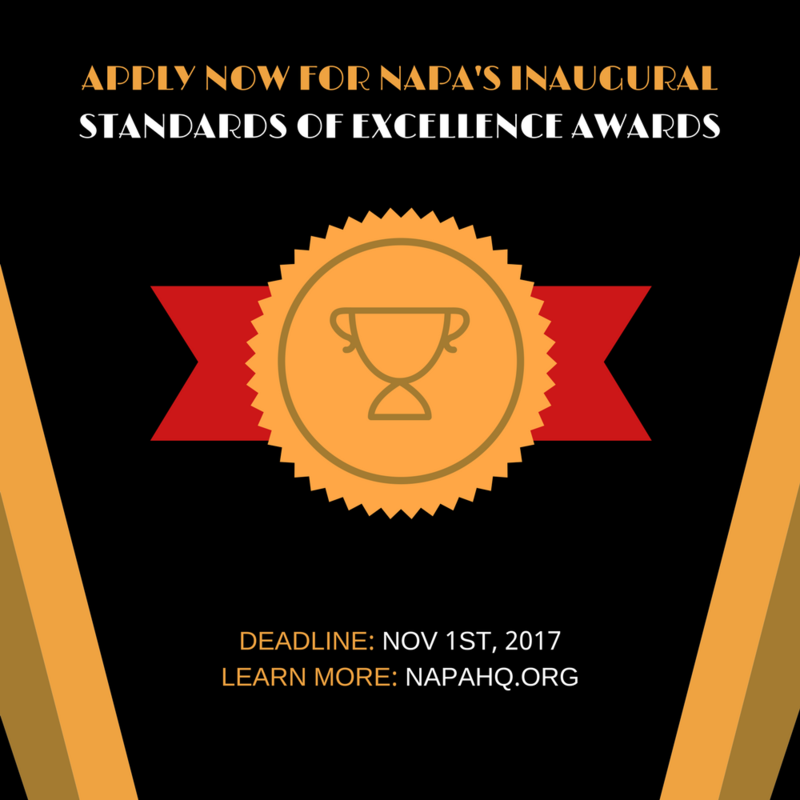 NALFO exists to unite and empower its Latino organizations and their communities through advocacy, cultural awareness and organizational development while fostering positive interfraternal relationships and collaborating on issues of mutual interest. 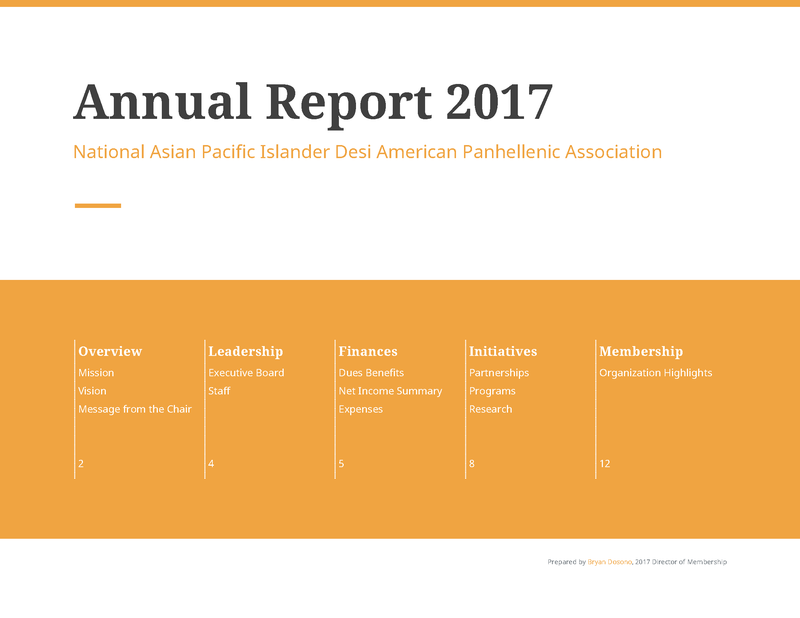 About the National Asian Pacific Islander Desi American Panhellenic Association NAPA shares a commitment to fraternal unity and assisting our membership in advancing the fraternal experience. 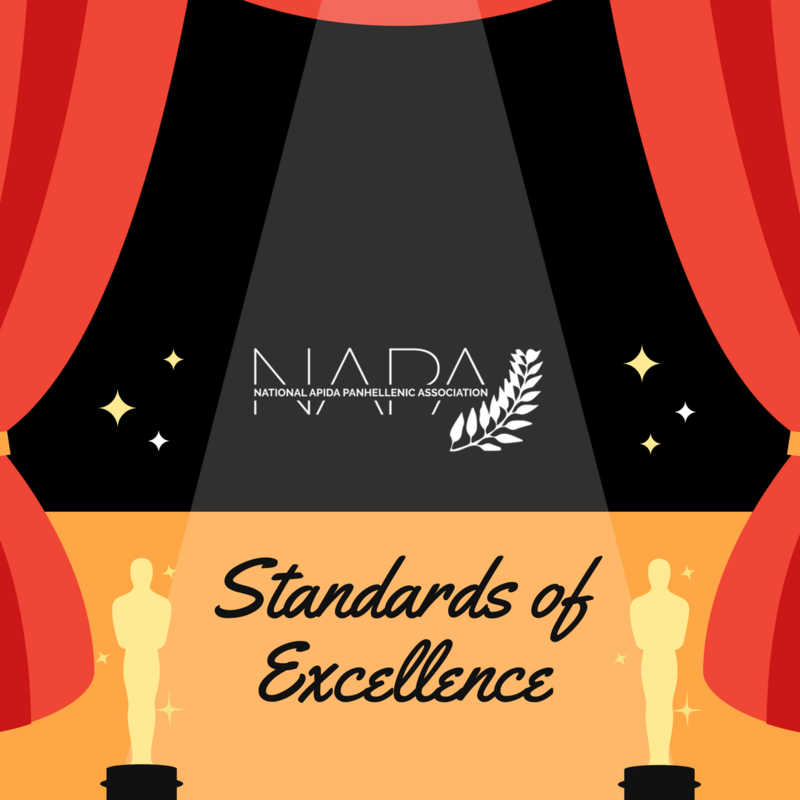 Formally organized in 2006, NAPA currently is comprised of 18 culturally-based member organizations. About the National Multicultural Greek Council NMGC is an umbrella council for a coalition of Multicultural Greek-Letter Organizations (MGLOs), established in 1998. 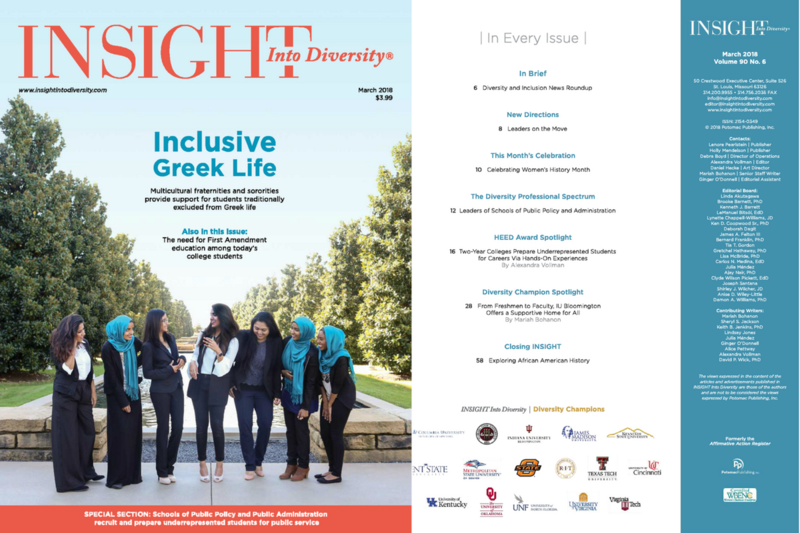 The purpose of NMGC is to provide a forum that allows for the free exchange of ideas, programs and services between its constituent fraternities and sororities; to promote the awareness of multicultural diversity within collegiate institutions, their surrounding communities, and the greater community-at-large, and to support and promote the works of its member organizations. About the Association of Fraternity/Sorority Advisors Through programs, publications, networking opportunities and other resources, AFA represents the community of campus-based fraternity and sorority advisors and is the leading voice in aligning the fraternity/sorority and higher education experiences. ### Download statement as PDF.